Very few things are as frustrating as delivering 5000+ pound per acre peanuts to the buying point and having them grade “Seg 2” because of insect injury, and when it happens there are usually a lot of questions. What caused it? Why did it happen? When did it happen? Could we have done something to prevent it? What do we do next year? All of these are excellent questions, but unfortunately sometimes the answers are not very satisfying. So far this year I have seen peanuts grade seg 2 because of peanut burrower bug and rootworm feeding. There will be some burrower bug injury every year, and it remains to be seen if losses in 2018 will be above average. While we typically think of burrower bugs causing problems in dry years or in non-irrigated fields, irrigation and/or adequate rainfall do not preclude problems. We are working very hard to learn more about the factors that contribute to burrower bug injury, and we have tested the efficacy of a wide range of potential management tactics. Deep tillage and the use of granular chlorpyrifos are still the only management tools that I can recommend for this pest. 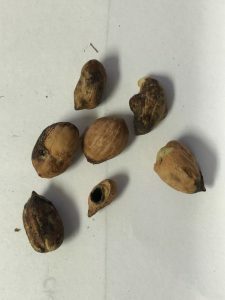 Rootworms (southern corn rootworm and banded cucumber beetle) require moist soil for survival, and conditions were perfect for rootworm development in peanut for much of the 2018 growing season in many Georgia counties. There were rootworm infestations and pod damage in my research plots this year in fields near Tifton where I have never observed these pests in the past. In our trials at Plains where rootworms are more common, infestations this year have been severe. I see the majority of damage in our later planted peanuts (first week of June), but I am not sure if this trend translates to commercial fields. (There is a gap in my planting window from 15 May until 6 June because of rain.) Rootworm larvae feed directly on pods. They can penetrate the wall of young pods and will feed on the developing seed. When this happens the pods generally rot and will not make it into the combine at harvest. 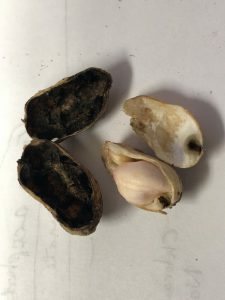 Feeding on older pods can result in direct injury to seed and/or provide an entry point for pathogens; in either case it is more likely that these more mature pods will make it into the combine where they can result in grade reductions. So, what if anything could have been done to prevent or reduce this injury, and should we do something different next year? As of fall 2018 the only insecticide that has shown consistent efficacy against burrower bug and rootworm is granular chlorpyrifos. Most of the research on rootworms in peanut was conducted in the Mid-Atlantic states and suggests that applications of chlorpyrifos made after infestations are established are not effective at reducing injury to harvested pods. Some of our recent research at UGA indicates that chlorpyrifos can reduce rootworm damage when applied to existing infestations, but the study is not complete. It is important to remember that burrower bug and rootworm infestations are sporadic. Growers who have never had a problem should not change their practices, and those who experienced damage for the first time in 2018 may not see problems in 2019. Scouting remains the most important tool a grower can use to assess the potential for and extent of insect problems in the field. Though our knowledge of thresholds is incomplete and chemical tools are limited, knowing that a problem exists gives us the opportunity to make the best management decisions possible. 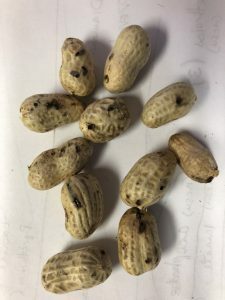 Contact your local UGA County Extension Agent for more information about this or other peanut pest management questions. Peanut seed from rootworm injured pods. Rootworm injury to peanut pods. Posted in Burrower bug, Rootworm. Bookmark the permalink.